Pride goeth before destruction (and an haughty spirit before a fall,) and pedantic perfectionism before elementary spelling errors such as "obession." Gentle Readers, this blog's first resolution for the new year is to be correctly spelled. Those of you who have done it the honor of bookmarking it, note that the URL will be, as of the 31st, operaobsession.blogspot.com. It will actually reflect the title of the blog, as it was always intended to do! Let joy be unconfined. All content, comments, etc. should transfer without a hitch. ...Famous last words? I hope not. In other exciting news, I will soon be indulging myself by posting a subjective list of my Favorite Things in Opera from this past year, and what I'm most looking forward to in the spring. Regardless of the whens and ifs and whats of celebration, I wish you joy, Gentle Readers. And Bach. Which can often be, in my experience, the same thing. The rest of the Bach is under this link. 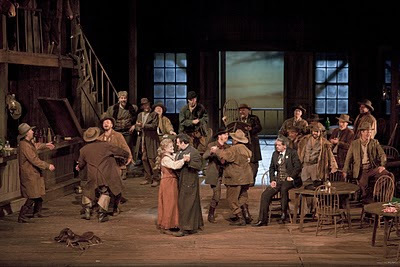 Last Saturday (18 Dec) I went with a friend to see Fanciulla a second time (photos (c) Ken Howard for the Met.) The luxury of attending two performances in a run will probably remain rare (exception: next spring's Die Walküre. The Beloved Flatmate and I have a date with the rush tickets line, I'm going a second time with another Wagner-impassioned friend, and my darling mother is going to try Wagner for the first time, mostly pour les beaux yeux de Jonas Kaufmann. We'll see how that goes.) 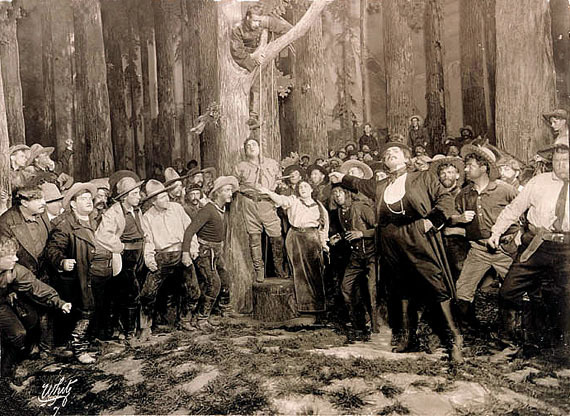 But, back on topic, which is an extra post for Fanciulla, in the spirit of acknowledging the glorious, heartbreaking, thrilling fact that no two opera performances are the same. Sitting in the balcony instead of family circle, I got a better view of some of the production's lighting effects, which worked nicely both to evoke the passage of time in this opera which is so shaped by it in the libretto, and to underscore the dramatic trajectory. I am still bothered by the production's fussiness. I saw more clearly this time why the bar brawl starts: I think it's touched off by an inebriated fellow at the bar. I still don't think it makes a lick of sense (to borrow the idiom of the genre.) And I really dislike the fact that Minnie is made to brandish her Bible in Act III. I think it takes away from the celebration of how unexpectedly disruptive the transformations effected by transcendent moral pronouncements can be. A few touches were altered: Nick's handing a Havana cigar to Johnson/Ramerrez at the end was more subtly handled, and therefore more sweet than distracting. And Rance, in that final tableau, picks up Minnie's pistol but doesn't level it at the lovers, rather staring at it like a man who has lost his bearings, then sinking to his knees, devastated. I went into the season premiere of Debussy's Pelléas et Mélisande imperfectly prepared, but eager; I came out shattered. The Cambridge handbook to the work was my cramming resource. The recording I ordered from the NYPL a few weeks ago didn't arrive, so my musical preparation was unfortunately limited to excerpts (and picking out motifs from that invaluable handbook on the piano.) Go here if you need a quick synopsis. I can't speak to what the musical atmosphere of the opera usually is, what inflections or tempi are customarily given to the score. Under Sir Simon Rattle, the Met orchestra created a dark tapestry of sound that reflected the piece's changing moods and atmospheres, from claustrophobic caverns (here, scaffolding; still stifling) to mysterious seascapes, while maintaining a sense of tension fueled by the desperate actions of people trying to find their fate (or flee it.) Space was also given for the sounds of silence, through hushed pauses in the music and deliciously drawn out pianissimi. We heard not only the sounds of the sea, but the sounds of light and darkness, of doubt and desire. Although there were a few rustlers, and what seemed like excessive coughing in the few instances where the curtain was lowered between scenes, the audience seemed to be sensitive to the delicacy and tension of the piece; with an exception for Yniold and Golaud's scene at the window, applause was limited to the intervals, and was not premature. Ein ernster Tag, ein grosser Tag! Ein Ehrentag, ein heiliger Tag! Right now, I am euphorically happy. The Metropolitan Opera, after giving me multiple surveys in which they did not ask how financial considerations affected my ticket-buying habits, have introduced a Student Club. Behold the promised land: here is the link to registration with details of all the privileges appertaining thereto. It's true that the option to buy $25 or $35 tickets on the morning of performances that aren't sold out has long existed; it's just been very difficult to find that out on the website. And in my 2.5 years of Met attendance, none of the flyers I got in the mail advertised that, either. Furthermore, student tickets have in the past proven to be chimerical; the Beloved Flatmate and I have asked, not infrequently, about availability, only to be rebuffed. But the wilderness years are (possibly) over! If these student tickets, quantity and location unknown, continue to be elusive, then it does me no good to be rejected over e-mail as well as on the phone or in person. But, if this does mark a turning point, who knows how many performances I may attend sitting down during the second half of the season? And there are more benefits: dress rehearsal access (so exciting) and shop discounts (that could be dangerous, of course... but still exciting.) Oh, Metropolitan Opera, ricco non sono, ma un core vi dono. I admit, it took me some time to warm to Fanciulla. When I first found the Tebaldi/Del Monaco recording , in college, my sophomore self just couldn't get past California miners shouting "Hello! Hello!" and singing rousing choruses of "Doodah doodah day" in a Puccini opera. The lexicon of John Wayne films meeting Puccini (and exciting, experimental Puccini at that) threw me for a loop. But I kept listening (finding Corelli, Frazzoni, and Gobbi along the way,) and I'm glad I did; I love the sweep of the music and its rich harmonies, and the drama keeps revealing more details. So I was thrilled to have my first live Fanciulla one hundred years to the day from its premiere at the Met. (There's a nifty website in honor of the occasion with all sorts of goodies--interviews, pictures, scholarly articles!--which I just discovered this week.) I had some quibbles with the production, but Nicola Luisotti cherished the details of the score, the Met chorus made a great camp of miners, Marcello Giordani was a very sympathetic bandit, and perhaps most importantly, Deborah Voigt sang and acted Minnie with a commitment which made it clear that she loves Minnie, and believes passionately in her courage and its significance. Yesterday I went to hear the first of three concerts in which Sir Colin Davis leads the New York Philharmonic in my beloved Beethoven's rarely performed second symphony, and Des Knaben Wunderhorn with soloists Ian Bostridge and Dorothea Röschmann. I had heard neither piece live before. Feeling more than usually incompetent, faced with an attempt to describe a symphonic performance (hence the self-deprecation in the title,) I'll keep this brief and hopefully coherent. Under Davis (surprisingly spry in appearance!) the NYPhil sounded warm and played with vivacious responsiveness. The Beethoven flowed like a conversation, individual parts clear and crisp, forming an elegant whole where the anticipated resolutions always held something unexpectedly complex. I'm anything but a connoisseur, but I enjoyed the performance thoroughly. This was not only my first live Wunderhorn, but also my first time hearing Bostridge and Röschmann in person (so many firsts in one evening!) They had good chemistry together and both seemed to feel a strong connection to the music. There was superb work from Davis and the orchestra here, too. Unfortunately, Ian Bostridge will have to be marked alongside Alice Coote as an artist I'm glad to have heard, but must still look forward to hearing in peak form. I had some trouble hearing him at the lower end of his range, especially at the outset, and was surprised and dismayed. He seemed to be fighting a cough, though, and was forced to the discreet use of a handkerchief towards the end of the set. (It is "cold season" in New York: the audience filled the hall with such a symphony of coughing and hacking as I hope never to hear again, by no means limited to the breaks between movements or songs.) Still, Bostridge produced some beautiful tones and haunting phrases, often with an unexpected, incisive emotional twist. More power to him, and good health. Röschmann was a treat. Her voice was radiant and rich, and filled with emotion, and her treatment of the language delighted my German Language Nerd soul. Her characterization of the mother and child in "Das irdische Leben" was a standout in a riveting performance. For more of Sir Colin with the NYPhil, lucky New York area folks can see not only this concert on two more dates, but also, on the 9th-11th, a program including Mozart's 36th symphony and Nikolaj Znaider with Elgar's violin concerto which, according to Jessica Duchen, is an experience not to be missed. I decided to take refuge from NYC's winter rains in sunny Seville, and headed down to see Elina Garanca's polarizing Carmen on Tuesday evening. 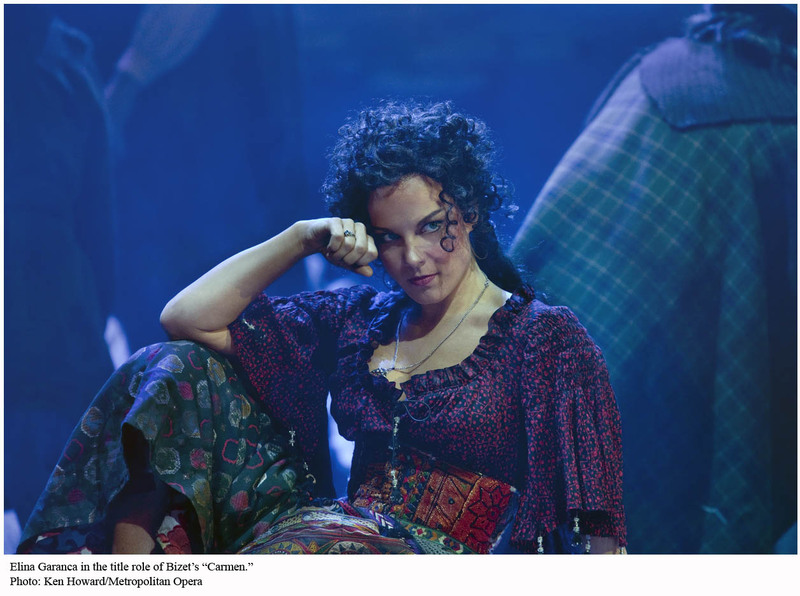 I'm glad I did: she has a vocally superb Carmen ("Duh!" you may exclaim, Gentle Readers; and you are right to do so, given the reactions of the international press. Still, I was genuinely surprised by just how good she was.) Furthermore, I feel as though she also has a fascinating Carmen just waiting to break free. There are more details on Richard Eyre's production in my review of the performance I saw last season, with a different cast, than I'll include here. Although it's fair to say that Eyre could have exploited and explored the 1930s setting of his Carmen more, the production stood up very well for me in this second viewing. The action flows well, there's a clear point of view on Carmen's world, it can comfortably house a variety of different interpretative choices, and caricature is avoided.